on conjecture, anecdotes, and limited data, but that’s not the case with Office Idiots. 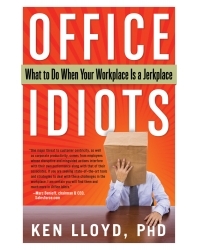 Written by Ken Lloyd, one of the foremost experts on jerks at work, this book relies on data from actual workplaces across America to present a sweeping and frighteningly accurate snapshot of the antics of office idiots. Deal with some of the most off-the-wall and absurd forms of office idiocy. Avoid enabling behaviors that actually bring out office idiocy in others. Make sure you don’t become an office idiot. Ken Lloyd, PhD, is a nationally recognized Southern California management consultant, author, speaker, and newspaper columnist. He has taught numerous MBA classes at The Anderson School at UCLA and lectures at many other universities. He is the vice president of planning and development at Strategic Partners, Inc. and a frequent television and talk-radio guest, as well. He has authored several books, including Jerks at Work and Performance Appraisals and Phrases for Dummies. A member of the American Psychological Association and the Society for Industrial and Organizational Psychology, he graduated from UC Berkeley and received his MS and PhD in organizational behavior from UCLA.